It's the default leap for every former hack, and one that I've taken myself, to an extent, sort of. Because for me freelance work is all about flexibility. It could mean providing strategic PR advice, writing website copy, editing, subbing, speaking, broadcasting, singing, teaching, fishing, whisky tasting, crisis management, social media ghostwriting, speechwriting, being nice to tourists, selling books and other stuff on Fleabay, and even some paid-for journalism. But hey, it's better than working. New Shetland Life Magazine: Islanders wanted! This has been a difficult magazine to put together for lots of reasons, but I think in the end it's a really good read with some fantastic photographs - and the opportunity for you to take some that will perhaps be just as good! 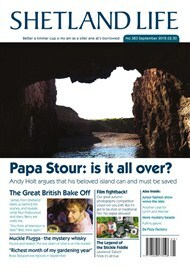 Andy Holt from Papa Stour contacted me several weeks ago to suggest a piece about the problems being faced by the island - only eight permanent residents now - and his impassioned article makes for salutary reading. Fancy a move? It is one of the most beautiful places in Shetland. Funnily enough, since taking over as editor of Shetland Life I've been looking at something to commemorate the 40th anniversary of the arrival on Papa of the 'first hippies'; Andy was one such. As it turns out, it's a melancholy anniversary. Meanwhile, The BBC2 show The Great British Bake Off has taken over the Morton family's lives, to an extent, as my son James is one of the competitors, and for the summer's duration our kitchen has been awash with flour and sourdough starters. James shares some of the show's secrets with Shetland Life readers. We have a unique (these days) photography competition that demands the use of film; another thrilling detective story from Marsali Baxter, regular features like Rosa Steppanova's superb gardening column and Ann Prior's brilliant recipes. And I absolutely love John Brown's hilarious memories of his first motorcycle - a 1940s Velocette. I can see the slope, the rising road ahead, threading its way upwards along the coastline. There’s a lurch of disappointment in my stomach. It’s been a hard morning, cold and damp and in company. I’m not good at company. I’m not good at people, not cycling with them. They’re inevitably much fitter and faster than I am, and younger, and I’m always taken right back to schooldays, that desperate need to compete, to outpace, to win. Lactic acid. That's what's burning in my thighs and calves. Over half a century of lazily walking, running, falling over and getting back up again. That's what's wrong with my knees. I can actually hear my knees, if the traffic's quiet, crunching, squeaking and creaking like bits of an old wooden ship asked to cope with a lumpy ocean. I'm all at sea. Why am I doing this? I'm out of my depth. These days, I’m not a competitor, never mind a winner. I’m a plodder, a gasper, an agonised get-off-and-pusher. I’m 56, fat, unfit and fuelled by beer, sugar and fried food. I'm an out-of-breath to the shop for a half bottle of Grouse, four cans of Guinness and a large bag of tortilla chips cyclist. Bryce and his pal Dave, 40-something, serious Sunday fitness riders, are lean and lithe, and although they’re kind and keen to help me along the road, indeed tried to tire themselves out by doing a fast 50 miles prior to meeting me, I can tell that Dave wishes he wasn’t burdened with this heavily-laden, very overweight tourist. It’s the way he races on ahead and waits at farm gates, arms folded, staring at the sky. His bicycle is an expensive aluminium racer, his lycra-clad body bent around it like a bow. Bryce is a bagpiper. His lungs are strong, but he’s heard me on the radio and he wants to chat. "I'm just here for the craic," he says. His cycling clothes are baggier, his bike grey steel. I’m content to let him talk, as my lungs, no longer tobacco-seasoned by still a little emphysemic, are not chanter-fit. I'm not really up to broadcasting the couple of feet from bicycle to bicycle. I'm knackered. I find it difficult to pedal and speak at the same time. I find it difficult to pedal. Bryce sticks with me, even when I wave him ahead, spluttering with pain outside Culzean Castle. And then, groaning, I crest a wee hill, turn and see that gradually elevating ribbon of grey, wet tar ahead of me. I just want this to end. I want to stop. If these guys weren’t with me, I would stop. Fifteen miles or so I’ve come today, and it’s taken me two hours. What is the bloody point? In a car, I’d be there. No, I wouldn’t have left yet, because I wouldn’t need to be there yet. I mean, I’d leave later because all I have to do is get to Ayr for lunch. Ayr, wha’ nair a toon surpasses, for honest men and bonnie lasses. Burns Central. My dad, my son, my daughter. They’re meeting me there for lunch. To see if I’m still alive. To try and talk me out of this mad caper. And then the strangest thing happens. I'm getting ready to expend more muscle-crunching, cramping effort on climbing the slope ahead of me when I notice that I'm freewheeling. Up the incline. I look at Bryce, beside me. He's laughing. "Aye, it's something, isn't it?" Suddenly, I know where I am. We are on the Electric Brae. The Magnetic Hill. I am in the grip of a mysterious power. Gravity has no authority in this part of Ayrshire. I've known this slice of road since childhood, in fact, but never on a bicycle. It was a place parents loved to experiment with cars, when automobiles were fewer and further between, and you could stop one on this stretch of road without risking tail backs, collisions and raging tattooed BMW drivers who've been watching too much Jeremy Clarkson. And wee kids loved it. The sheer weirdness of it. A hill that didn't work. A slope which had anti-gravitational properties. It was the rock, we were told, full of iron. Magnetism. Would it work with…with a Reliant Robin, which was made of plastic, I asked? Who knew? Certainly not my dad in his VW Beetle, his Vauxhall Cresta, his Ford Zephyr. He parked them, facing uphill . He switched off the engines. They crept spine-chillingly forward, sometimes. Sometimes they didn't move at all. On a bike, though, you seemed to fly up the Electric Brae, known locally as Croy Brae. It was like being pushed by God up the A719 between the beautifully named Drumshrang and the negative-sounding Knoweside. My mount, hugely laden with panniers front and rear, and made of quality American steel, surged of its own accord towards heaven, or the Craig Tara holiday park just a bit further on towards Ayr. Against the wind. The ELECTRIC BRAE", known locally as 'CROY BRAE'. This runs the quarter mile from the bend overlooking Croy railway viaduct in the west (286 feet Above Ordnance Datum) to the wooded Craigencroy Glen (303 feet A.O.D.) to the east. Whilst there is this slope of 1 in 86 upwards from the bend to the Glen, the configuration of the land on either side of the road provides an optical illusion making it look as if the slope is going the other way. The term 'Electric' dates from a time when it was incorrectly thought to be a phenomenon caused by electric or magnetic attraction within the Brae. I'm thrilled, magically transported to a world where cycling uphill does not hurt, where freewheeling everywhere is the rule. I get the same feeling I did when i first let out the clutch on a motorbike, and felt the marvellous, joyous thrill of powered two-wheel balancing. I was defying, painlessly, the power of the landscape, the power of the world to hold me down, hold me back.